Here we are, only week till Christmas Eve. The last few days since J has finished school have gone past in a cyclone of activity - yet I don't feel I've actually achieved a whole lot. Today was one day that I thought I'd actually DO something purposeful with the boys. 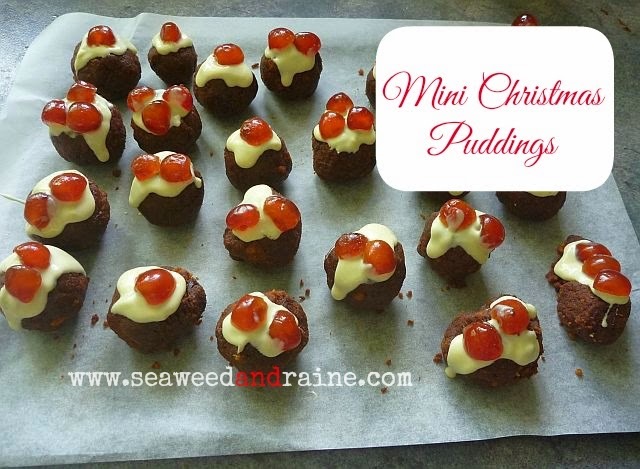 We made mini Christmas Puddings. The boys have been asking to do them for the past two weeks - how could I deny them the pleasure it gives them? So the date was set for today. And so, I guess, a Christmas tradition of our own is born. 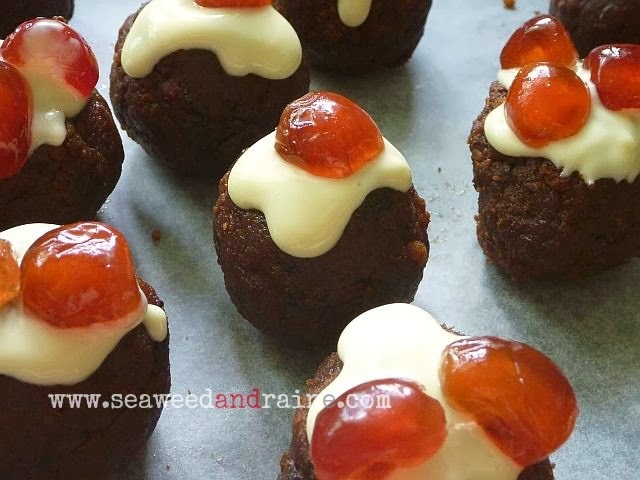 They took turns crumbling up sections of the cake, and breaking up the chocolate while I cut glace cherries into halves. The whole process seemed to go so quickly, yet watching them do their part in turn was a heart warming sight. Mixing the melted chocolate in and rolling them into balls took a bit more effort with the big bowl of crumbly mess. I'm pretty sure the temptation to lick their fingers was there, but they worked on with a determination that kids twice their age might not have shown ( I'd promised them that they could have one when the last cherry was placed on top). 1. Crumble cake thoroughly in a large mixing bowl. 2. Melt chocolate in microwave on a medium heat for about 90 seconds and stir until all lumps are melted. 3. Mix thoroughly through crumbled cake. 4. Roll into balls about the size of a golf ball or a little smaller. 5. Melt white chocolate on a medium heat for 60 - 90 seconds (If you choose to use more white chocolate, you will need a little more time than 60 seconds - it will also depend on your microwave). 6. Use a teaspoon to dollop white chocolate on top till it looks like custard running down. 7. Top with glace cherries and pop in the fridge till the chocolate sets. They will keep in the freezer a bit longer than that.